I get questions about this often and thought I would present something of an answer. Simulants are a different thing, and most of them ARE pretty cheap, but colorless and near-colorless lab-grown diamonds are pretty close to the prices of their natural counterparts. This often comes as a surprise, because people have seen or read things to the contrary, and because the whole synthetic gemstone business has precedents. Synthetic sapphire and ruby have been on the market for over a century and in most cases are very inexpensive. Synthetic emeralds are lovely, reasonably priced, and have been around for decades. Synthetic versions of spinel, amethyst, chrysoberyl and many other gemstones are plentiful and inexpensive. When lab wizards figure out how to make a stone in the lab, it is usually extremely high quality, as large as you want, and a fraction of the cost of the natural equivalent. Why are diamonds so different? The problem has several components but I’ll address two of them here. The first has to do with cutting. Converting a diamond from a piece of rough into a finished gem that you can wear is hard. It’s much more difficult than with other gems. Gemstones are cut by using smaller, harder stones as an abrasive. That works with everything else but diamonds, since they’re the hardest abrasive available. Diamonds must be cut with other diamonds. It doesn’t seem like that would work at all but there’s a slight difference in hardness depending on direction in the crystal, so cutters are able to exploit this difference by a very tricky dance and by paying careful attention to the grain while they work. It’s labor intensive hand work and the same for synthetics as it is for natural. It takes very specialized equipment and some very specialized talents. Robots, lasers, et al. have become tools for the cutters, but diamonds are still cut one at a time by highly skilled artisans. Depending on your stone, as much of the cost can be attributed directly to the cutting processes as goes to the costs to mine or grow the diamond. Another huge chunk has to do with the distribution channels, meaning the jewelers, shippers, tax collectors, grading labs, advertisers, appraisers, and others who are involved in the distribution chain. All of these costs are the same for both, so even with a drastic change in the cost of mining or growing, these costs would remain. A huge drop in prices would also need a drastic change in the way diamonds are cut. The second is the way diamonds are grown. 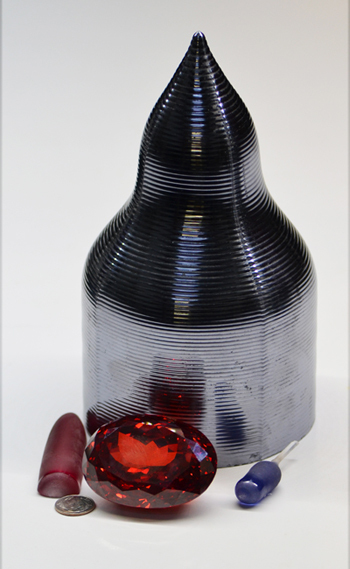 Synthetic sapphires start out HUGE. We’re talking the size of a potato or even a soccer ball. (see below) Corundum, the base mineral that makes up both sapphire and ruby, can be grown the same way a stalactite grows in a cave. A factory can make a thousand of them at once if they want. The cutting house, which can be largely an automated affair, is slicing it down to whatever size the customer wants. Waste is irrelevant. The cost of a kilo size piece of rough is 1000 times the cost of a gram and if they lose 90% to the cutting process, that’s fine. They’ll make more. Synthetic diamonds start out small and grow rather slowly with time. The machines making stones for the gem business can grow just a couple of carats a week. The difficulty of this growing increases exponentially with the size. That is to say, making very small stones, say the size of a piece of dust, is relatively easy. Yet making a gem quality 10 carater is effectively impossible with existing technology. Waste is a huge deal, just like with mined diamonds. Synthetics dominate the industrial market because it’s easy to make little ones. It is near certain that the stones in your $10 nail file came from a lab, not a mine. But stones bound for the gem business are very different. They need to be big and they need to be relatively pure, both of which pose huge technical problems. Will they have a technological breakthrough that makes it easier? Maybe. It’s happened to other industries but predicting the future is notoriously difficult. There have been smart people with significant budgets working hard at this for the last 70 years or so, and forecasters have been predicting a breakthrough that whole time. So far, it’s still pretty tough. What if synthetic diamonds really do become available cheaply and by the bucketload like they’ve been predicting for the last 100 years or so? Stranger things have happened. What will that do to the value of natural diamonds? Will there be a catastrophic collapse in the diamond market? It’s an interesting question, and although it seems edgy, this is actually a well-trodden path. Synthetic rubies, cultured pearls, synthetic spinel, and synthetic alexandrite are examples where the products from the labs are superb and are available for a fraction of the cost of their natural counterparts. Technological advances tend to make better and better things available cheaper and cheaper. And the engineers in the labs routinely do miracles. A lot of what was impossible 50 years ago is passé today, and prices do occasionally plummet because of it. It’s happened before with other industries, but it HASN’T happened with gems. People who want an awesome 3-carat natural Kashmir sapphire simply don’t consider the lab stones to be an acceptable alternative no matter how pretty they are. Similarly, the people who are buying a $30 synthetic sapphire because it would look great with a particular outfit are usually not seriously considering a $30,000 mined stone as an alternative, even if it’s a bargain at that price. In that regard, not all that much has changed. People now want paperwork to “prove” the origin of their stone. This wasn’t necessary a few decades ago, but that’s about it. Some shoppers continue to be happy, or at least willing to pay whatever it takes to get the real thing, and others are happy with the lab products. Both are right. The gem market is really two parallel markets that complement rather than compete with each other. There are other examples. Large natural pearls are extremely cool, extremely rare, and extremely expensive. So much so that people who think of pearls are almost always thinking of the cultured product. Even so, there IS a market for natural pearls, and there are customers who want them who are willing to pay the prices. If anything, the prices have gone UP in the face of plentiful alternatives. Lab-grown emeralds are a fantastic product that have offered competition for the lower end goods by offering a better looking alternative for the same money, but top tier natural emeralds are more expensive now than ever before. It’s actually already happened in fancy-colored diamonds. Natural fancy-colored diamonds in red, blue and pink are bringing in record prices at auction even though there’s a booming market for synthetics in these colors at a fraction of the prices. 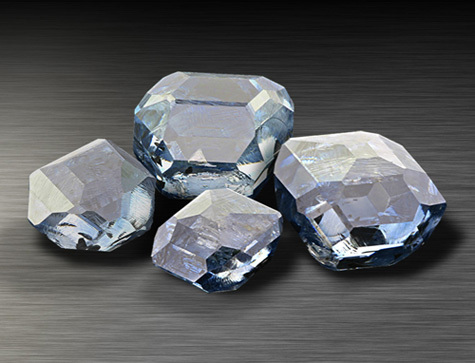 In fact nearly all synthetic diamonds for the gem industry are in fancy colors. Neither market is driving the other. Is this “what if” scenario really likely? Is it plausible? Is it even possible? Does it require alien intervention, some similar game changer, or just some smart people coming up with a few new ideas? Nearly everything is possible, and the scientists working on it are smart folks who have a big paycheck hanging on the outcome, so I hate to use the word impossible but I think it falls into the category of highly unlikely. It takes both a revolutionary breakthrough in growing technology and a revolutionary breakthrough in cutting. They’ve been working for 70 years on the growing and over 400 years on the cutting. It hasn’t happened yet, and they don’t seem to be even close. Next year or even sometime in the next 50 years may be the time, but I wouldn’t bet on even that. Maybe the aliens can help them out. So, are advances in synthetics a problem for diamond shoppers? I think not. People buy diamonds for emotional reasons and because they are one of nature’s miracles. People buy synthetics, because they like the idea of an incredible product made by some brilliant people, and they like the history of knowing it came from a lab. They see it as a feature, not a problem. These are complementary markets, not competitive ones. With proper disclosure, both sides can be happy with their purchase for generations to come. Failure to provide disclosure is a problem with the dealer, not the product. If the dealer is lying, it’s a problem whether they are lying about the origin, the grading, the treatments, or even whether or not it’s a diamond at all.